Having been reminded by the recent sentencing of a Rwandan war criminal to life in prison, Heather, our minister, shared something with us yesterday that completely stunned me. I had no idea that the vast majority of those who took part in the Rwandan genocide were Christian. I’d read about the killings in the newspapers at the time (although I don’t think the Western press really covered this all too well) and had seen “Hotel Rwanda” but all I seemed to remember was that this bit of nastiness was based upon intense tribal animosity. To the ‘sophisticated’ Western ear it is easy to dismiss such barbarism when the word ‘tribe’ is heard. And why should we be outraged over a bunch of Hutus and Tutsis hacking each other to pieces with machetes? Most us, who learned about Africa from Tarzan and Jungle Jim, would expect nothing different. But Christians? The Saved? Today? We just don’t do such things. Horrors like this belong in the church’s distant past, along with the Crusades, the Inquisition and the Puritan Witch Trials. Why isn’t this common knowledge, especially among Christians? 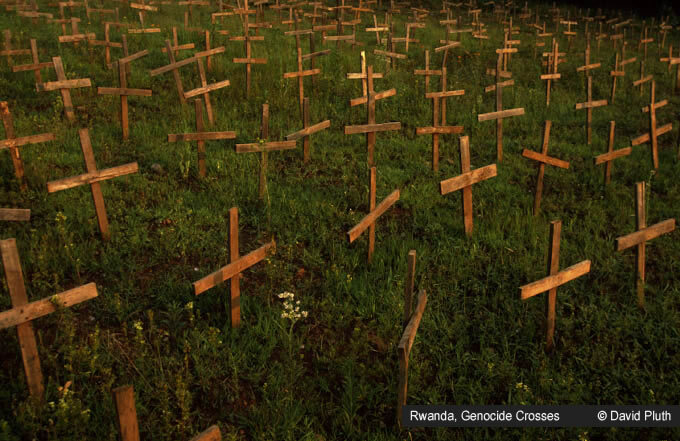 The 1994 Rwandan genocide, killing an estimated 800,000 Tutsis and moderate Hutus, is made even more incomprehensible by the documented participation of many representatives of Rwandan church societies. How could God fearing nuns, and even a bishop, take part in the most cruel crimes against humanity committed on African soil? Even worse, several church societies allegedly were co-responsible for the growing hatred that led to the genocide. It remains an enormous contradiction to the Christian Message of Love. On 7 May 1994 soldiers and militias arrived at Shyogwe Diocese aboard a red pick-up vehicle to transport civilian Tutsi refugees to the killing sites. “On that day Bishop Samuel Musabyimana was present and, addressing the soldiers and militias, publicly stated that he did not oppose the killing of Tutsis, but that he did not want killings at the Diocese and that the Tutsis should be taken to Kabgayi to be killed.” (Indictment by the International Criminal Tribunal for Rwanda against former Anglican Bishop Samuel Musabyimana). On 22 April 1994, Séraphine Mukamana had hidden herself in a garage when militias attacked a convent in Sovu in southern Rwanda. “We sought refugee in the garage and closed and barricaded the doors. Outside a bloodbath is going on. Suddenly an orphan begins to weep as it gets to hot in the garage. At once, the killers approach the garage.” As the refugees refuse to come out, the militia leader Emmanuel Rekeraho decides to burn them alive in the garage. “‘The nuns are coming to help us. They are bringing gasoline,’ I heard [Rekeraho] say. Looking through a hole that the militiamen meanwhile had made in the wall, I indeed saw Sister Gertrude and Sister Kisito. The latter was carrying a petrol can. Shortly upon that, the garage is set on fire.” ( Testimony against two Catholic nuns, Sisters Gertrude and Maria Kisito in a Brussels court, May 2001 [for their involvement in the slaughter of at least 5,000 civilians that had sought refuge in their monastery at Sovu])…..
… The accusations against clergy of the Free Methodist, Presbyterian, Baptist and Seventh-Day Adventist Churches are equally shocking. According to survivors, Bishop Aaron Ruhumuliza, head of the Free Methodist Church in Gikondo, Kigali, helped the militia carry out a massacre in his own church on 9 April 1994. Michel Twagirayesu, the President of the Presbyterian Church of Rwanda and a former vice-president of the World Council of Churches, is alleged to have worked closely with the killers in the Presbyterian stronghold of Kirinda, Kibuye, betraying parishioners and fellow-clergy alike, according to a report by African Rights. Much of the history of Western missionary activity in Africa, although often well-intentioned, presented a truncated and paternalistic form of the gospel. Claude Nikondeha, founder of Amahoro Africa, has called this the ‘Evacuation Gospel’, which aimed at saving souls but did little to transform the reality of African Christians suffering extreme poverty and colonial oppression. And yet the gospel of Jesus Christ as the good news of the establishment of the Kingdom of God is so much more – it is in all spheres of life truly transformative. In his most recent book with the above title, Brian McLaren shows how the economic and political structures of the modern West have created a lethal suicide machine which destroys the very things vital for the survival of humanity and planet Earth. He argues that the real message of Jesus Christ encompasses an alternative reality and that His followers are called to make this Kingdom vision a reality. Nov 10 2002 – After the sliver of the new moon had been sighted, Saleh Habimana joined the growing ranks of Muslims in this central African nation and began the daylight fasting that marks the holy month of Ramadan. Later, Rwanda’s leading Muslim cleric joined men in embroidered caps and boys in school uniforms to pray at the overflowing Al-Fatah mosque – more testimony to the swelling numbers of Muslims in this predominantly Christian country. Though Muslims remain a small percentage of Rwanda’s 8 million people, Islam is on the rise eight years after the 1994 genocide brought 100 days of murder, terror and mayhem. More than 500,000 minority Tutsis and political moderates from the Hutu majority were killed by Hutu militiamen, soldiers and ordinary citizens in a slaughter orchestrated by the extremist Hutu government then in power. …As Rwandan Christian Tutsis and Hutus try to reconcile, their Muslim countrymen believe they could learn something about tolerance and solidarity from Islam. “Reconciliation is not necessary for Muslims in Rwanda, because we do not view the world through a racial or ethnic lens,” Sagahutu said. The Rwandan Genocide should remind Christians that before we so glibly paint other cultures and religions as murderous and barbaric we need to address those vicious tendencies that continue to find shelter within the modern church. This entry was posted on December 22, 2008, 5:18 pm and is filed under Catholicism, Christianity, Protestantism, Spirituality. You can follow any responses to this entry through RSS 2.0. You can leave a response, or trackback from your own site. Let us forgive those who participated in the genocide and pray to God that the world will never experience the horror again. Sort of like those Fine Church Goin’ Men who were (and I am certain are) part of those who burned crosses, bombed churches, and took part in lynchings in the U. S.
Nothing is more shocking. First time I’ve heard about that. Jihad by extremists cannot compare. Nuns directly helping in the massacre (of scared civilians) are most shocking report. I find them more shocking than the reported genocide of the Khmer Rouges! [I think both have one thing in common: The annihilated were treated as nothing but “demons” or “beasts”.] I won’t want to judge the nuns. We don’t know their sufferings in the hands of the other side so we don’t feel how they do. In a racial and social class violence there can be very little difference between combatants and unarmed supporters. But, I think the acts are unjust, shocking, much so since they were committed by some religious. Good points. My question is this; why did so many Christians ignore the teachings of Christ, their supposed leader? You expect good Communists to obey Stalin, Pol Pot and Castro. Their leader was Marx and ‘the end justifies the means’. It is a bit harder to understand how good German Lutherans could obey the orders of Hitler, but they certainly did. It seems that, in spite of what is said in church on Sunday or at the nightly bedside, the Gospel message is just not as important as the one about revenge, power, material security and tribal (a.ka. patriotic, nationalistic and cultural) fears. What message did these “Christian” Angolan, German, South African and segregationists get from the Bible? What gospel was it? Was something missing or was the message skewed heavily towards their own personal and supposed assured eternal salvation rather than Jesus’ message of peace,self-sacrifice and forgiveness? Christians have certainly been keen on sacrifice – as long as it’s not their own. I’m not talking about those racists in Africa, I’m talking about the kind that bombed the churches in Alabama. You know, the one in which four young girls were killed? I’m also talking about the those like the police officer in York, PA. The officer allegedly killed an African American during the 1966 riots. The officer was acquited several years ago–like in 2004–of the killing. What drives the people? We could go into this for hours, couldn’t we? But, Bruce – were the church bombers and that cop self-avowed Christians? People have rights to be atheist, or rights to beliece that they are atheists. People may campaign against any religion and cult. But yeah, nobody has any right to bomb any church. People who did must be sick. I don’t know of these guys were “self-avowed” Christians, but apparently, they were considered important enough to be protected by “the system” for nearly 40 years. What I am saying is that Americans are just as guilty of ethnic cleansing–as were the British during the various wars (see the practice of spreading diseases through “Blanketing” American Indians). We ain’t as sanitized as we would like to think. Marxism is materialism. They are on the same plane with apolitical science. That man should not go farther than facts. Pure materialism will neither deny nor confirm existence of God. To deny the existence of God is un-scientific because one has no proof to prove that there is no God. That there is no God was Communists’ politics. Super structures had to be brought down and religion got in the way. With objectives attained, as in Russia and China, religion has been tolerated by ‘atheist’ communists, in fact. Neither confirm nor deny is the real stand of a pure Materialist on something considered unknown, otherwise he is a fake. Indeed, that has been a big question ever since. The Philippines, for example, is a dominant Christian nation. It is among the bottom list of economically and politically backward nations.